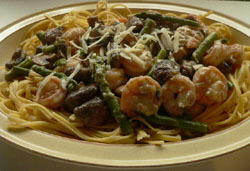 Linguine with Shrimp and Mushrooms with a few spears of asparagus tossed in the mix. Served with garlic bread and a bottle of chardonnay Wine and you have a great dinner for two. Put pot of water on stove to bring to boil for Linguine. Measure oil and put in small bowl, add pressed garlic and set aside. Clean and quarter mushrooms, clean and cut asparagus into 2 inch pieces, clean and devein shrimp, coarsely chop shallots. Cook the pasta in boiling water until tender, approximately 6-8 min as directed on package. Put asparagus in microwave save dish, cover and cook on high for 4 minutes. In a sauce pan, prepare a white sauce. Over medium heat, melt butter, blend in flour and cook a minute. Whisk in white wine, salt & pepper. Cook for another minute or so until until well blended. Remove from heat, whisk in half & half, return to heat, stirring constantly cook till bubbles and thickens slightly. Keep warm. Heat large non-stick fry pan on medium heat and add the oil and garlic. Saute shallots in garlic olive oil for 1 minute, add mushrooms saute for 2 minutes, add shrimp, continue to saute another 2 minutes. Add asparagus and continue to saute another 3 minutes. Lower heat to simmer. Pour 1/2 of the white sauce over mushrooms spinach shrimp mixture and 1/2 the white sauce over the pasta and gently toss each. Put the cooked linguine on a serving platter and pour the shrimp sauce mixture on the pasta. Sprinkle with shredded Romano cheese. Tips: Trick to making this Linguine with Shrimp recipe is to have all the ingredients prepared and measured for cooking and assembly. You will find this to be a very easy and delicious meal. Make your garlic bread before the meal so it is done and ready once the dinner is completed. No need for a salad since the meal includes asparagus unless you are trying to stretch the meal for more people. One of the Easy Salad Recipes of greens and cut up vegetables works nicely.